Telltale Games employees were surprised when CEO Pete Hawley announced the closure of the company at a staff-wide meeting. One employee, a source told Kotaku, had been working until 3 AM the night before with no inkling that the studio was about to let them and over 200 other employees go, leaving behind a skeleton crew of 25 to finish off work on a final project (Minecraft: Story Mode according to Variety). The suddenness of the meeting at the company’s San Rafael, California headquarters was described to Kotaku by a former employee who was there but wanted to remain anonymous as they pursue looking for work elsewhere in the video game industry. The timing was just one of the meeting’s unwelcome surprises. The head of human resources dropped another bombshell, to the audible shock of Telltale employees: there would be no severance. Those laid off were encouraged to begin applying for unemployment as soon as possible and were told their health benefits would run out at the end of the month, just nine days later, according to a source and to social media postings by ex-developers. They had 30 minutes to leave the building. The lack of severance, a detail that began circulating on Twitter shortly after the shutdown, was one of the bitterest details in a game studio collapse that has sparked outrage and sympathy among those who play and make games. Telltale had been around for more than a decade and was in the midst of rolling out a new episode of its signature series about the Walking Dead, episode two of a supposed four, planned for release tomorrow. The rationale for failing to pay out severance provided by Hawley, according to Kotaku’s source, was that this was a business closure rather than partial layoffs, like the 25% downsizing that hit the studio last November. (A California law, the Cal-WARN Act, requires employees provide 60 day notice for mass layoffs but allows some exceptions that could have applied to Telltale.) That wasn’t much consolation, however, to the people who had been working long days leading up to Friday. While the source knew the company’s future was in question, they never suspected the end was so close at hand. By the time they got back to their desks, their work Google accounts had already been disabled. “None of my sleepless nights or long hours on weekends trying to ship a game on time got me severance today,” tweeted now-former Telltale character artist Brandon Cebenka in the hours following the meeting. “Don’t work overtime unless you’re paid for it, y’all. Protect your health. Companies don’t care about you.” Another ex-employee said that they’d wished they taken more vacation time while they still had a job. “All I want right now is to REST for a couple of days,” they tweeted. “But since we got no severance and our insurance expires at the end of the month, I don’t have that luxury.” Neither employee provided further comment. This disconnect between the commitment of Telltale employees to the studio’s grueling project deadlines and the sudden way in which the studio severed that relationship has inspired a renewed debate within the video game industry and gaming community about crunch, workers’ rights, and unionization. According to Buck, at least one employee had joined Telltale only one week before the closure and had relocated across the country to do so. Another was a foreign national in the country on a work visa who must now leave “within a few days.” While none of those laid off are being given severance, contract workers who weren’t full time won’t even be able to collect unemployment. Telltale Games did not respond to multiple requests for comment. During the Friday meeting at which the company’s closure was announced, Hawley blamed the studio’s fate in part on recent seasons of The Walking Dead not meeting sales expectations, according to the anonymous source present who spoke to Kotaku. Hawley echoed this sentiment in his public remarks later in the day, in which he said that though the studio had released some of its best games in 2018, that had not translated into adequate revenue. Following the financial and critical success of The Walking Dead: Season One in 2012, Telltale had grown and begun working on an increasing number of licensed games, including The Wolf Among Us based on the Fables comics, a Game of Thrones adaptation, and Batman: The Telltale Series. This increased workload, under the leadership of studio co-founder Kevin Bruner, led to increasingly difficult working conditions, which The Verge reported on at length earlier this year. According to The Verge, teams would work overtime to meet development milestones, something Buck also corroborated in her tweets, only for their work to be derided in review meetings with Bruner who would go on to require heavy re-works without adequately revising the development schedule to provide more time. Hawley, formerly at Zynga, replaced Bruner in September of 2017. One of his first major acts was a restructuring period that month which resulted in 90 employees being let go that November. At the same time, morale among the development teams apparently improved. A source told Kotaku that following Bruner’s departure, projects stayed on track more frequently and shipped in a form that more closely resembled what had been decided and agreed upon during the initial planning stages. In a statement released last Friday, Bruner said he was saddened by the loss of people’s jobs and the studio he helped create. He also touted his own leadership. “Prior to my leaving, we were able to avoid sweeping layoffs and (somehow) managed to ensure that we always had work for everyone,” he wrote. “We worked hard and sometimes it seemed like we had more than we could handle but we stuck together and forged ahead.” Bruner is currently suing Telltale for what he claims was its interference in the sale of his holdings in the company after being forced out. In addition to the feelings of frustration, regret, and in some cases, stories of exploitation that employees have posted online or shared in conversations with Kotaku, there has also been a tremendous outpouring of support on social media for the people affected. Two hashtags have circulated on on social media following the news: #TelltaleJobs and #TelltaleMemories. The first is filled with colleagues promoting one another’s work and sharing postings for new jobs in the games industry, and the other has given former Telltale employees and the fans of the games they created a chance to celebrate their past work. Some former employees have relayed interesting anecdotes about how certain parts of Telltale games came to be. “When we requested the animation for Rhys turning off Hyperion monitors in Tales from the Borderlands Episode 5, the requested animation was worded as ‘Rhys flips off the monitors as he runs by,’” wrote narrative designer Molly Maloney. What the team got back was literally Rhys flipping the monitors the bird as he runs by, one of the series’ funniest moments. Other Telltale employees have shared unofficial in-game animations they made just for fun, such as this one of Walking Dead protagonist Lee Everett throwing a hilarious tantrum about an empty cupboard, or this video of Lee collecting bananas. [Update - 10:30am, 9/25/18]: A class action complaint has been filed in California federal court against Telltale Games by an ex-employee. 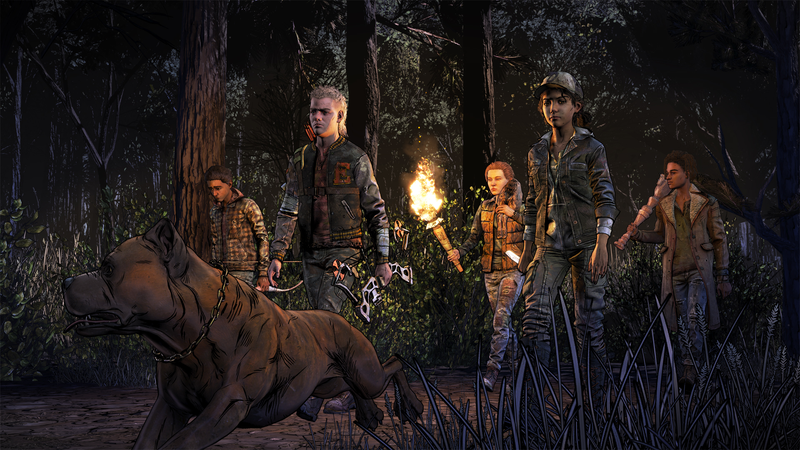 The complaint alleges that Telltale Games violated the state and federal WARN Acts by failing to provide 275 workers who were laid off from the studio last Friday with the 60 days notice required by law. The complaint is seeking a judgement from the court that Telltale pay all of the laid off employees the wages, salaries, 401k contributions, and any other money they would have normally earned during those 60 days. It’s unclear at this time how many other employees have or will join in the lawsuit and whether it will be successful. The WARN Act includes several exceptions, including certain instances in which a company is seeking to acquire new business or capital that would allow it to keep running normally and notifying employees of a potential shutdown could jeopardize those deals. Correction: A previous version of this article stated Telltale was being sued for violating the California WARN Act. It is also being sued for violating the federal WARN Act.